The Prioress and myself were fortunate to make our way across the pond last week to attend the largest gathering of true British real ale in one place. Unlike the Great American Beer Festival the British equivalent only serves “real ale” which is defined roughly as being unfiltered “live” beer served without the use of CO2, which means it has to be pushed with beer engines or in some inventive cases driven by ambient air. In either case such beers have a limited shelf life. In general low gravity real ales are fermented in 3 or 4 days and immediately put into casks with a plug of hops and finings. They then undergo secondary fermentation in the cask for about a week or until tapped (at most 28 days). After delivery to the publican the cask is tapped and vented for up to 48 hours before being emptied within 1 or 2 days. 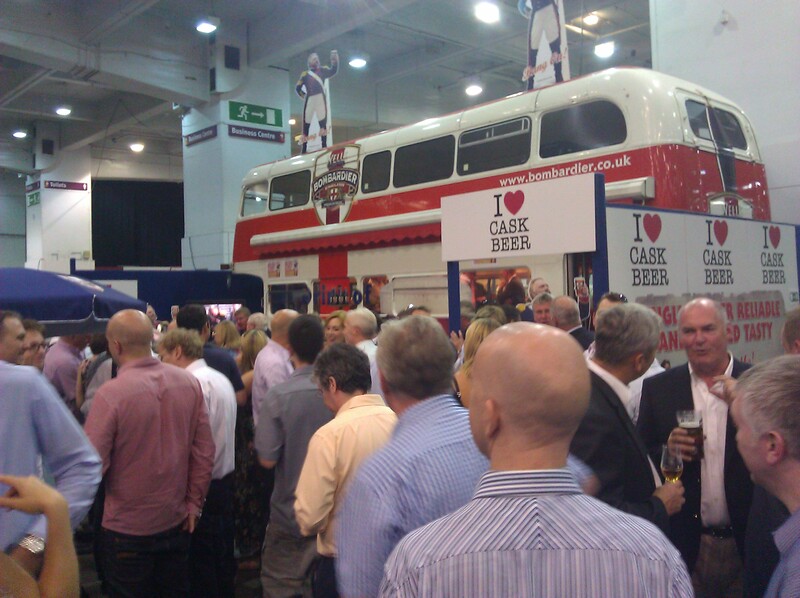 The Great British Beer Festival occurs over the course of 5 days beginning on Tuesday when the best beer in each category is announced. Attendees can pay for 1/3, ½ or a full pint of any beer offered with prices that normally run around 1 pound for the 1/3 serving to a little over 2 pounds for a full pint. In most cases the 1/3 pours were well above the marker on the glasses which provided more than enough beer to form an opinion. Before heading to London and the festival we enjoyed three days on York, a medieval walled city in the north of England with a strong brewing tradition that includes nearby Sam Smiths and Theakston, makers of Old Peculiar. The latter is located in Masham about an hour from York and well worth the day trip. Another well regarded brewery, Black Sheep is in the same small village and was started by a family member that left Theakston in the early 1990s. 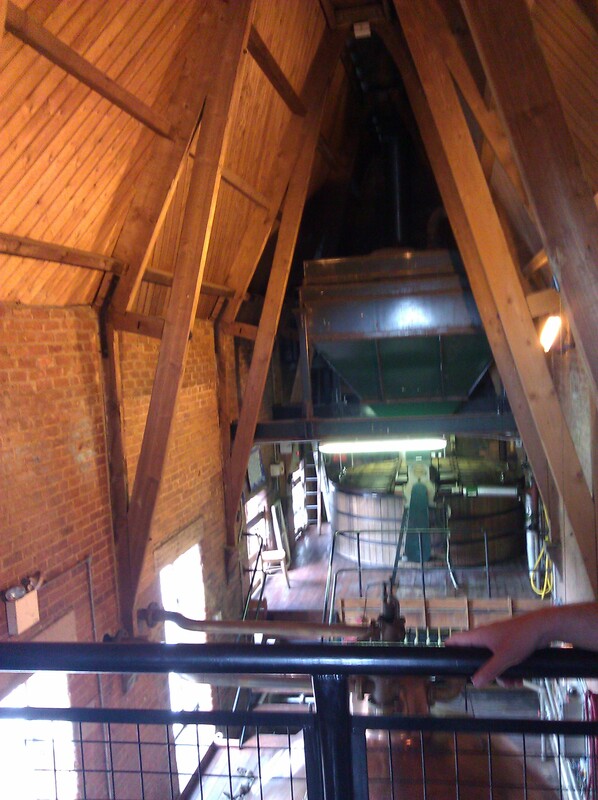 A tour of Theakston and its operating three level gravity brewhouse is recommended, as is the barrel aged Old Peculiar, served only within a 50 mile radius of the brewery. York is full of great pubs with great selections and better prices than you will find in London. But I digress, back in London we were fortunate to stumble upon a cask festival at the Rake, a wonderful beer bar near Borough Market. The owners were very welcoming and provided great advice on where to go and what to see. Another friend had arranged a tour of some new breweries and special pubs the next day so we had a lot to look forward to. 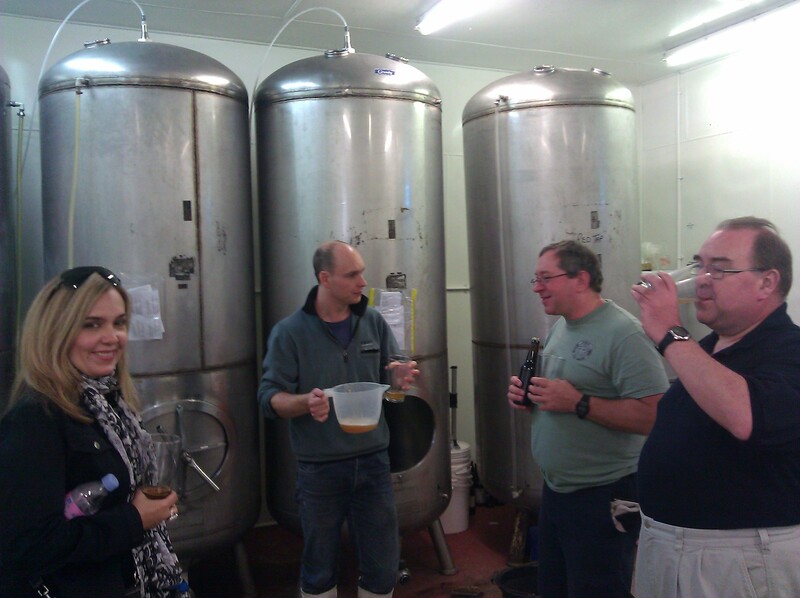 Our first stop the next morning was Redemption Brewing (redemptionbrewing.co.uk) in Tottenham. Luckily there were no riots while we were there, but we tried all that the brewer Andy had on as well as some of what he had in the finishing tanks. He has a fairly basic set up, but all the beers were clean and balanced. They ranged from Trinity, a bitter at 3% to Hopspur at 4.5%, named after the local “football” club. From there we traveled by cab to Brodies Brewery and the William IV Pub in East London. 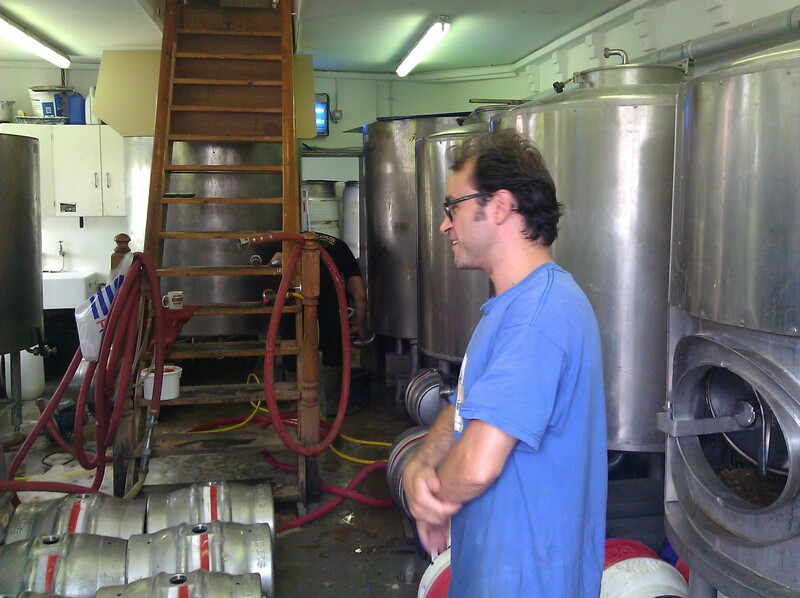 Brodies produces a huge selection of cask beer for their own pubs as well as other pubs in the area on a 5 barrel system that is used every day. From American hoppy IPAs with names like Amarilla to Imperial Stouts and fruit beers, they had over 20 hand pumps with the same number of different beers. If I remember right we tried a few ounces of each one. The only problem with this approach is that some of the beers were not as solid as others, while some were great a few had pronounced flaws ranging from diacetyl to acetaldehyde. From there we made our way by a bus and then train to the Southampton Arms, a CAMRA London pub of the year with a good selection of special casks. Next up was the Euston Tap, a new pub located in a gatehouse at Euston Station that was really unique with a great selection of not only real ale, but also many bottles including lots of American varieties. Our final hop was to the Harp in downtown London which was already filling up with the after work crowd. A well deserved CAMRA pub of the year, the Harp runs through casks quicker than any bar we visited and every selection seems unique. Thus ended a long day with great hosts. 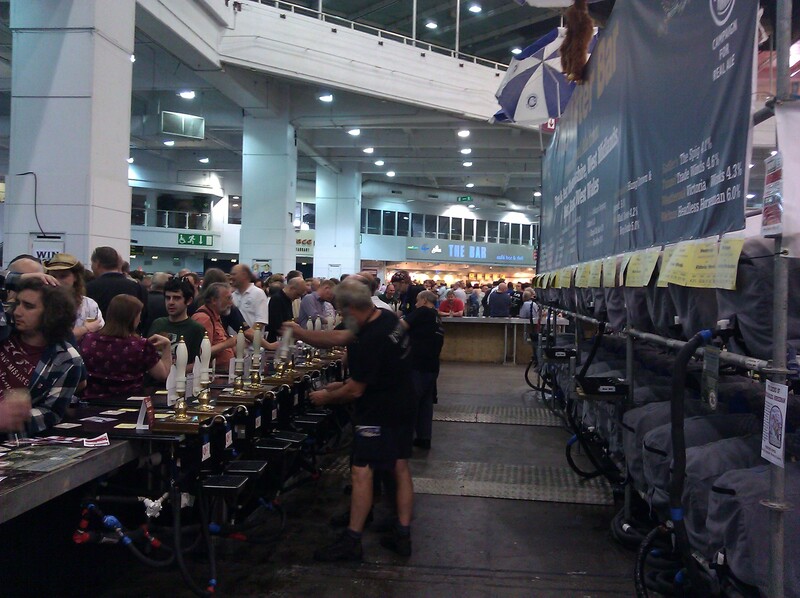 On Tuesday we made our way to Earls Court and the GBBF. Next year the location will change to Olympia and some CAMRA members seem wary of what that will mean given the smaller venue and the prospect for even more attendees. 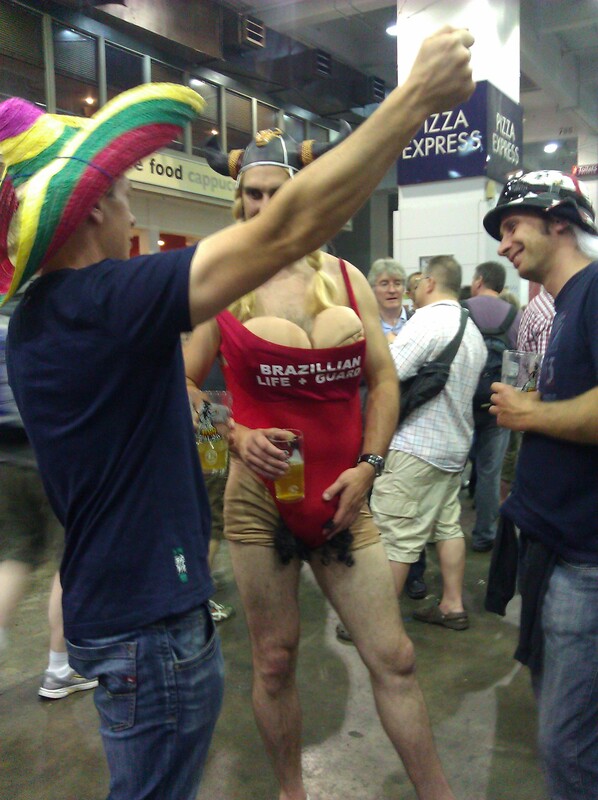 Inside the GBBF is organized by geographical regions, but there are also a multitude of food stalls, trinket sellers and even carnival type games that allow you to win beer swag. Food stalls sold everything from Cornish pasties to jellied eels to gourmet cheese, but there were also Indian and Middle Eastern selections as well as traditional fish and chips and pork pie fare. One snack tried we just couldn’t bring ourselves to appreciate was a South African beef jerky called Biltong – it was similar to American jerky but not as dry with a lingering gamey almost putrid flavor that stayed with you way, way, way too long. We determined it must be an acquired taste. As to the 700 or so beers, ciders and perries this year, since coming in 2009 you can certainly see some changes. Two years ago you could find the odd cask IPA that used American hops like Rooster’s Yankee, but the vast majority of beers served were bitters with an occasional mild thrown in at each bar. This year almost every region had examples the showcased Cascade, Amarillo, Simcoe or another distinctively Pacific Northwest hop. And after running its course to some degree in the US, a number of brewers had American Black Ales, the first I have seen in the UK. Notwithstanding the fact that all of them were labeled Black IPA, which remains a clear contradiction in terms, most were solid and at least one, made by Thornbridge, was comparable to any made in Oregon with pronounced Simcoe and a whopping 6.9% ABV. A number also made IPAs that would stand up in the US including Arbor with a 7% Yakima Valley American IPA. As interesting as it was to try Americanized versions in the UK and to peruse the American cask offerings from Green Flash and the like, my goal was to try the best British beers and I wasn’t disappointed. Some of the larger breweries had quality examples we rarely see in the US including Green King’s 7.5% Very Special IPA infused with a substantial amount of English Hops and Welsh brewer Brain’s 6.5% Strong Ale brimming with chocolate and caramel notes. The historic and reintroduced Worthington’s White Shield at 5.9% was a particularly nice treat emblematic of what a great special bitter can be. Unfortunately each day we visited the Timothy Taylor booth however they had already run through the cask of Landlord, possibly my favorite British bitter of all time. Of the lower gravity milds, of which there were several thankfully, Harvey’s Sussex at 3% was dark, roasty and delicious, truly recommended as a fantastic example of the style if you can find it and one of the top ten beers tried at the event. The company’s Lewes Brown Ale at 4.8% was also a prime example of that style. 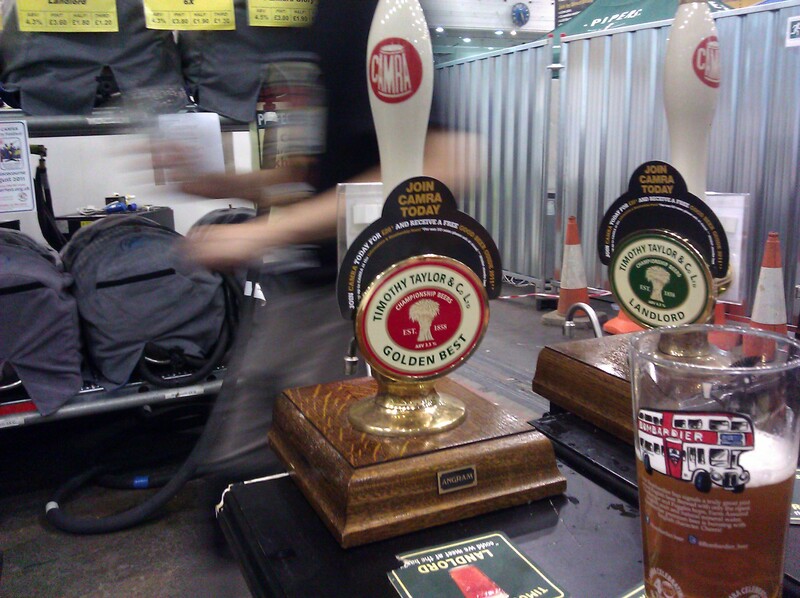 Of particular note this year as well were the number of non-mainstream or in some cases historical cask beers. In the case of the latter the 6.5% 1872 Porter made by Elland stood out. Holden’s 7.2% Old Ale was also a stand out. A number of breweries also submitted flavored beers including several with chocolate. One that won was a chocolate orange stout that seemed overdone, but our favorite by far was Titanic Brewing’s 4.5% Chocolate and Vanilla Stout which we came back to not once but twice, before they ran out that is. In addition to cask beers they also had bars with only bottle selections and also bars with air pushed keg beers from the Czech Republic, Germany, Holland and elsewhere. 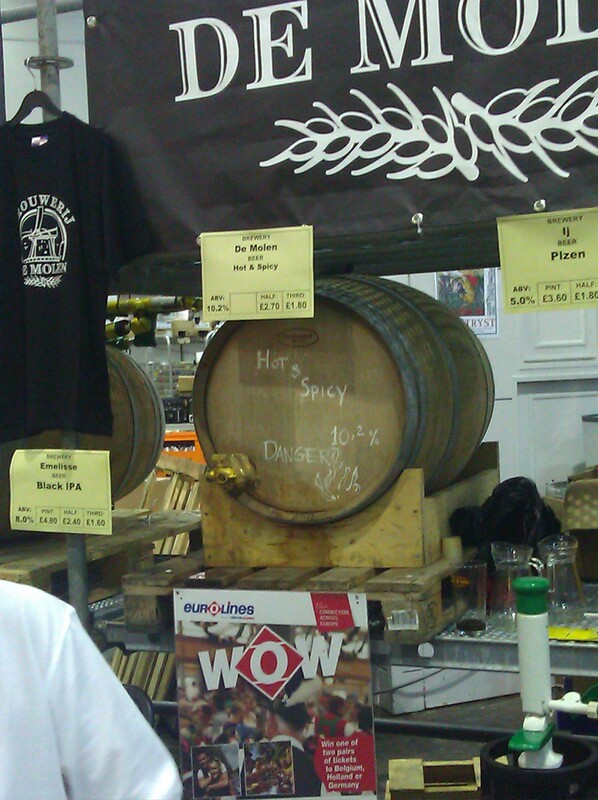 De Dolle pepper infused 10% Russian Imperial Stout from a large wooden barrel? Yes please. Andechs Helles, Schlenkerla Dopple Bock, the list goes on. One of our greatest finds which is no secret in the UK is beer made by a guy named Alex Liberati with Revelation Cat based outside of Rome. Apparently the guy likes American hops, wood aged anything, sours and high gravity. Included among his offerings were a 9.9% West Coast Double IPA and Mad Walloper, a smoked lambic…yes, smoked lambic. Both beers were clean and balanced with huge flavor profiles. Look for them in the US soon as Shelton Brothers is bringing in their lambics aged in everything from Acacia to French Oak. Hopefully some of that smoked lambic will someday come this way as well. This entry was posted in Beery Happenings Beyond. Bookmark the permalink.